In last week’s Star, Professor Anyang’ Nyongo, the distinguished political scientist and politician, asked, “What is in concept “tribe” that causes conflict among us?” He attributes the conflict not to tribalism but to the system of governance, in our case the presidential system (dominated by one or two tribes) which leaves no room for opposition parties (dominated by one or two other tribes). This view is contrary to that offered by another outstanding Kenyan intellectual, David Ndii, who attributed our problems, including very possibly the break up of Kenya as a state, to the rise of tribalism. The relationship, globally, between ethnicity, as populations mix, and governance is both varied and complex. It is true that sometimes governance, discriminating against particular groups, as under Kenyatta and Moi, promotes ethnic resentment, which can be manipulated as a political factor. More often, ethnicity shapes both politics and governance. There are many variables which bear on relations between the larger and smaller ethnic groups, and may impact on the system of governance: number and size of ethnic groups, geographical distribution, the hallmarks of ethnicity (whether language, religion, history); varying degrees of development and exclusion of ethnic groups, etc. And there are many different solutions to the “problem” of ethnicity, from secession to integration, and isolating the cultural aspects of ethnicity from politics. Anyang’ draws his conclusions from the 2002 elections which were won by NARC (a combination of parties and ethnic groups), implying that ethnicity played no part. The ensuing government led by Kibaki held out high promise of a national unity government, until that is, Kibaki and his close advisers reneged on his undertaking to distribute portfolios fairly between his and Odinga’s close advisers. Opinion polls declared Kenyans the happiest people in the world. Anyang’ has an unduly rosy picture (ethnicity-free) of those elections and the outcome. There were dissident groups who preferred silence to opposition. The ethnic factor was by no means absent: the dislike of Moi’s Kalenjin-dominated regime had brought other larger tribes together, dominated by a Kikuyu and Luo partnership, reminiscent of the immediate post-independence period. Moi’s candidate was Uhuru (he said that he was passing back to the Kikuyu power which Jomo had bequeathed to the Kalenjin). Moi’s sponsorship of Uhuru was sure to lead to his defeat: alienation from Kalenjin voters, and repudiation by the Kikuyu. The Kikuyu preferred the “genuine” Kikuyu candidate (Kibaki), and the Luos Odinga, though they voted for Kibaki because Odinga told them to do so. When the Kibaki-Odinga partnership collapsed because Kibaki reneged on his promise of power sharing, Kibaki turned to Moi for the support of Moi’s members in Parliament, having lost his majority—and dropped proceedings against Anglo-Leasing. The ethnic basis of political support, stimulated by politicians, has continued unabated (“vote for me because it is our turn to eat”). The vulnerability of tribes to the appeal by the leader to their tribal sentiments also governs the nature of political discourse (“our turn to eat”), while social and economic policies, social justice etc are left out in favour of criticism of the other candidate and his/her community. So are our politics impoverished. But our politicians not impoverished. Here I agree with Anyang’s analysis of the primary objectives of our politicians: not nation building but personal aggrandisement. The capture of the state is essential to their primary objective of what both he and I would describe as “primitive accumulation”, acquiring wealth through the theft of state resources, and to quote him, “the petit bourgeois ambitions, always selfish and opportunistic”. I agree with him that “tribalism was used as a veneer of pursuing individual projects of primitive accumulation”. But we seem to disagree whether the NARC government fitted this bill: he thinks not, I think yes. The parties made an advance agreement on the sharing of power/spoils, not the policies that they would pursue—this is why, on the whole, little attention was paid to policies once the “leaders” assumed their portfolios. He and his colleagues did not “feel at home”, to use Anyang’s phrase, because they were given insufficient share of the power and benefits of a party in government. Anyang’ and I do not disagree that national unity can be promoted; perhaps we disagree on our perception of the quality and objectives of our politicians. I agree with Anyang’ that it is possible to change the politics of primitive accumulation. But given our deep roots in this type of politics, –and the very large and complex structure of corruption and thefts, involving powerful cartels, the extremely high degree of rewards, the networks that transcend the state, and unwillingness of our institutions set up to fight corruption to discharge their responsibilities, means that even if politicians were converted to a new philosophy of the state, they may be unable to fight off forces well beyond their capacity. But I believe that Anyang’ is mistaken in his belief that a few changes to the Constitution, particularly in moving towards a parliamentary, prime ministerial system would do the trick. “A parliamentary system of government, amenable to consensus democracy, coupled with devolution, is perhaps our best option at the moment. If we had adopted it, Kenyans would by now have been politically socialised”. Not necessarily. My own preference and that of CKRC, Bomas and the Committee of Experts, was for a parliamentary system, as more suitable for a multi-ethnic society. Kibaki himself told the CKRC that we must get rid of the “imperial presidency” of the Moi (and he might well have added “Jomo”) type. But it was the Parliamentary Committee at Naivasha (with the support of all the parties) that wanted the restoration of the imperial presidency—and the CoE obliged. However, the virtues of parliamentary system can be exaggerated, as is clear from Kenya’s early years under a semi-parliamentary system. Acute political instability could equally be the outcome, with frequent votes of no confidence. It is clear from Anyang’s discussion that his preference for the parliamentary system is because he thinks it facilitates power-sharing. But it leads to power sharing only if the largest party does not have a majority. A large number of parliamentary systems have not led to power sharing. And when they have, they have not always succeeded—indeed, Kenya’s Coalition Government of 2008 was little short of disaster. Power sharing in multi-ethnic societies tends to freeze ethnic distinctions. The key virtues of the parliamentary system are different. One of them is its continuing affiliation with democratic practice. 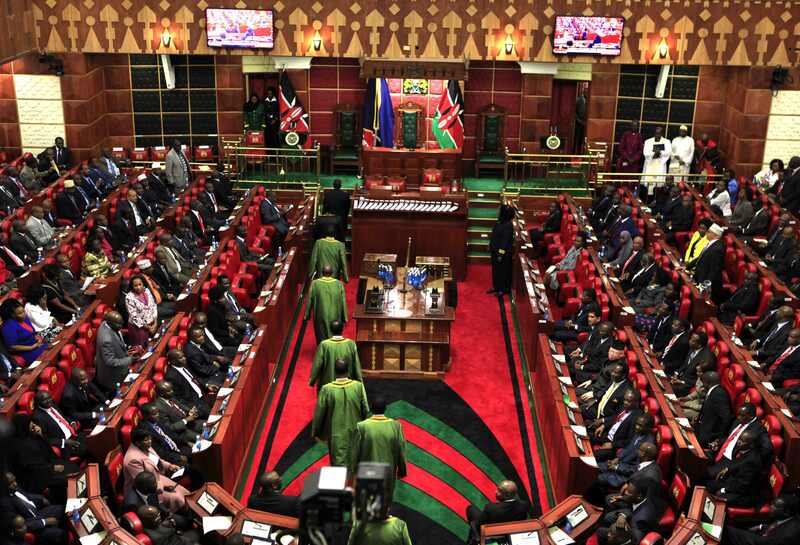 Politics are not only about power and wealth sharing, but establishing a vibrant, parliamentary democracy in which the role of the opposition is to keep the government on its toes, to scrutinise its policies and finances, put searching questions to it on the policies and conduct of the government, and offering policy alternatives—something on which parliamentary CORD members have been woefully inefficient, careless and indifferent. Instead, together with Jubilee parliamentarians, they have indulged in primitive accumulation, leaving the poor poorer, and not only Kenyans but the world aghast. We need a great deal more than power sharing to remedy the ills of our politics and society and to transform us into a united nation. Anyang’ is right that negative ethnicity can be removed, but not necessarily as he advocates. The CKRC and Bomas had crafted a constitution the primary aim of which was “unity in diversity”—through national values and institutions. For a multi-ethnic and multi-religious state, a great more is required than the contours of power. The incentives for ethnic voting have to be removed by requiring multi-ethnic and nationwide political parties. Government policies must be directed to equal citizenship, fair distribution of state resources, respect for cultures of all communities, special measure the marginalised groups, social justice, equal respect for all religions, and significant degree of self-government. These goals have achieved limited success, as politicians have kept alive ethnic politics and voting. The author is a director of the Katiba Institute and an Advocate of the High Court of Kenya.